Do you want to travel to domestic destinations and visit some Philippine popular places? Check this Cebu Pacific sale tickets for 2017 to 2018! On this promo, the Cebu Pacific sale tickets are valid to select local destinations only; featuring the new routes of the airline. 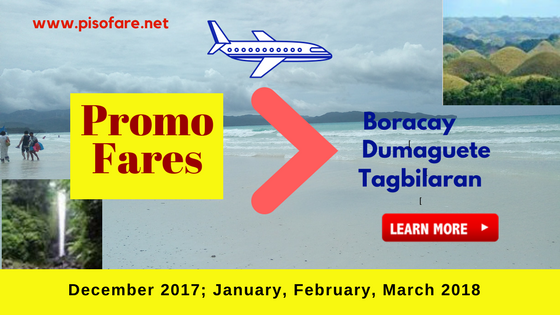 This is best for travelers from Clark who want to visit Boracay (via Kalibo) from Cagayan De Oro who want to visit Boracay and Dumaguete. This is also an opportunity for vacationers from Davao who would like to see the attractions in Bohol. Cebu Pacific promo fares have limited availability. Book fast to get the cheap fares! Quoted Cebu Pacific promo fares are valid for one-way trip and cover the base fare, Web Admin Fee, taxes and fees. It also includes free 7 kilos hand carry baggage. Though the present promo caters to limited routes, this offer a chance to see and enjoy the Philippine countryside. You might say that the fares are not so cheap. But take note that the affordable fares can be used for near travel dates. To get the Cebu Pacific promos, book tickets online at www.cebupacificair.com or buy the low fares at Cebu Pacific ticketing and sales offices and accredited ticket booking and travel agents. Want to receive updates on new airlines promos? Like and Follow our Facebook: PISO FARE TICKET to get notification in your newsfeed on seat sale and promos of Cebu Pacific, Philippine Airlines, Air Asia and other airlines for 2017 to 2018!